I spent my teenage years at West Point where my dad was on the faculty. During the summer months, called Beast Barracks, I’d be woken up every morning around 6am by the cadets running by my house chanting "I’m gonna be an airborne ranger, Gonna live a life of danger". 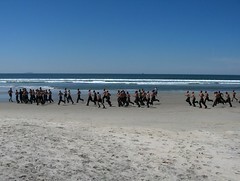 So when they ran by us on the beach today chanting something similar, I had to grab my camera and capture this.